Renowned water purifier brand Eureka Forbes has entered in Air Purifier category with four affordable variants. The USP of the brand’s products is its unique design which easily gets mingled with the décor of the room or car. Predicted to grow at the CAGR of 45 per cent during 2013-18, India's air purifiers market offers great opportunities for the existing and upcoming brands. A new entrant in the category, Eureka Forbes, which has entered in Air Purifiers market in the beginning of March this year, offers four variant for home, office and car’s air purification. Daily chores and cooking routines in the house release fumes that is inevitably inhaled by consumers, which might cause health issues like skin irritation, allergies and respiratory illnesses. Aeroguard Clean AirGLO that purifies indoor air with the power of negative ions. This unique product is easy to use and can fit in required spaces like kitchen, bathroom, laundry area or the pet section of the house and easily removing smoke and foul odour. With its compact dimensions and availability in warm colours, it easily mingles with the décor of anyroom and compliments it. Available in cold white (5500-6500k) and warm white (2700-3500k) colour tones with a life span of 10,000 hours at Rs1,390. Enriched with a unique 6-layered ACTONTMair purification process, it ensures a healthy and comfortable drive, leaving behind pure and fresh air by effectively reducing germs, bacteria, viruses, mould, fungus and odour from the car. The product offers a unique blend of powerful performance and advanced technology that is designed to ensure a perfect and comfortable driving experience. The USP of this product is its negligible noise levels and adaptability to any car which leads to effortless installation of the product in the car. The product is light weighted with only 365 grams and is priced at Rs3,990. The Aeroguard ACTON is an indoor air purifier that is a blend of superior technology and powerful performance. It provides a maze of seven strategically designed layers of protection that purifies air to leave behind clean indoor air. This innovative solution removes 99 per cent of pollutants from theindoor environment within a few hours of functioning, providing a healthy breathing environment that leaves the consumer feel rejuvenated, active, facilitates easy breathing and helps in improved sleep that results in a healthier life. Its intuitive and advanced technology constantly senses and displays pollution levels in the air by using an LED indicator. It switches to ‘Auto Mode’ and reacts accordingly to keepthe air clean and safe, while rejuvenating. The product consumers’ minimum voltage and power. The light weight product of 4.8kgs takes minimum space of approx 300-400 sq ft and is priced at Rs12,990. The Aeroguard ACTON Advance has an innovative feature of BreatheSafe Filter, which is an ideal solution for people suffering from respiratory disorders. This air purification system destroys and cleans airborne particulates, micro organisms and noxious gases and provide purified healthier indoorenvironment. 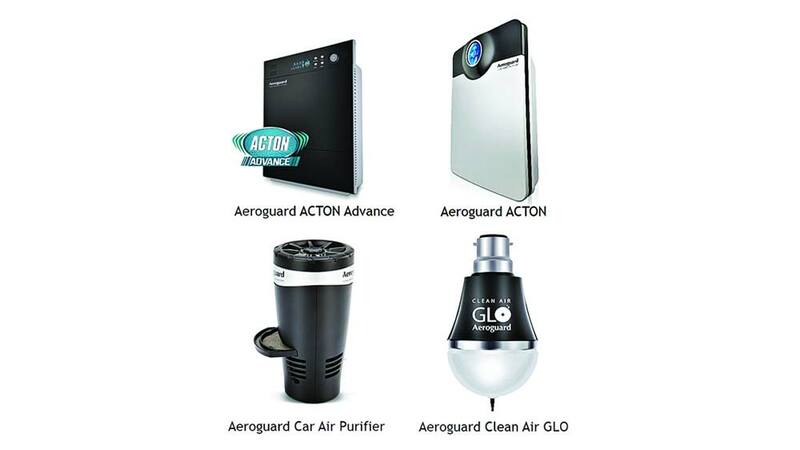 Aeroguard ACTON Advance is powered by an advance 7 step filtration process that goes beyond the capabilities of HEPA + Double UV Lamp + ACTON + BreatheSafe filter that remove smoke, dust and harmful impurities from the air and replenishes it with pure, bacteria-free air in the home comfort. The product is equipped with an intelligent Reminder whichtriggers timely warning about ‘Filter Change’. The Nano-Photocatalytic Filters in it helps in purifying the toxic gases andviruses, and is 300 times more effective than standard carbon filters. It is also enabled with self-cleaning mode. The Whisper Quiet Efficiency of the product maximizes air flow while maintaining a peaceful environment even when operational. Its overall weight is 8.5 kgs and is available at Rs 20,990. Significantly, the Eureka Forbes Air Purifiers are available only in metro cities like Mumbai, Delhi, Kolkata, Bangalore, Hyderabad and Guwahati, apart from the official website of the brand. Apollo standalone clinic in Ahmedabad..